Anyway, with me being away, we didn’t do our pumpkins, and since Shane’s parents don’t usually get any trick-or-treaters at their house, I haven’t bought any candy at all. I did, however, get to work over the weekend and whip up two fun desserts in honor of the holiday! Assuming we don’t lose power due to Sandy (fingers crossed! ), I’ll be sharing the second one on Wednesday. 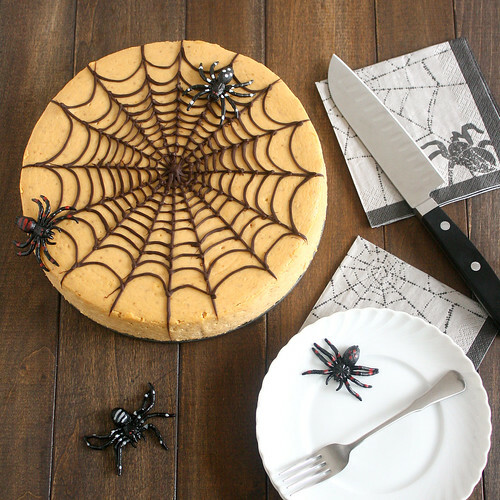 As much as I love the spiderweb, it was also important to me that the cheesecake actually taste good, and this one is definitely a winner! Initially I’d planned to do a no-bake cheesecake because making a “real” one always seems like a major time commitment, but I’m glad I made the investment for this spiced pumpkin version. It has a fantastic creamy, smooth texture and the pumpkin flavor really comes through without being overwhelming. I love the chocolate and pumpkin combo so I did an Oreo crust, but you could certainly do graham crackers if you’d rather. I’m not sure how much it comes through in the pics, but this is a really tall cheesecake – it’ll feed a lot of people. If you don’t have a crowd to serve, wrap it well and stick it in the freezer. That’s where 90% of this one went, Shane’s parents will be enjoying it well into November! Preheat oven to 325 F with a rack in the bottom third. Coat a 9-inch springform pan with nonstick cooking spray. Wrap the bottom and sides of the pan with a double layer of heavy-duty aluminum foil. To make the crust: Pulse the Oreos in your food processor until they are broken down into uniform crumbs. Turn them out into a bowl and add the salt, stirring to incorporate. Add the butter and use a fork to mix until the crumbs are evenly moistened. Transfer to the prepared pan and press into an even layer over the bottom (the bottom of a measuring cup or glass makes this easier). Bake for 10-12 minutes, or until set. Transfer the pan to a wire rack and cool while you make the filling. Get some water boiling to use for the water bath for the cheesecake. To make the filling: In a medium bowl, whisk the sugar, the spices and the salt together. Line a baking sheet with a triple layer of paper towels, then spread the pumpkin puree in an even layer over them. Top with several layers of paper towels and press to remove as much moisture from the pumpkin as possible. In the bowl of a stand mixer fitted with paddle attachment, beat the cream cheese for 1 minute. Scrape down the sides of the bowl and then add the sugar mixture in 3 additions, allowing each to incorporate fully before adding the next and stopping to scrape the bowl as necessary. Mix in the pumpkin puree, vanilla and lemon juice until well combined, about 45 seconds. With the mixer on medium-low, add the eggs, 1 at a time, beating until incorporated, about 1 minute total. Reduce the speed to low and gradually add the heavy cream, beating until combined. Use a rubber spatula to stir the batter by hand, ensuring it’s completely uniform. Pour the filling into the pan over the crust and smooth the top. Place the springform pan inside of a roasting pan. Place the roasting pan on the oven rack and pour boiling water (carefully) into the roasting pan until it comes about halfway up the side of the springform pan. Bake for 75-90 minutes, or until the center of the cheesecake wobbles slightly when the pan is shaken and the cake registers 150 F.
Remove the roasting pan to a wire rack and run a thin paring knife around the edge of the cheesecake and the pan. Allow the cheesecake to cool in the roasting pan for 45 minutes, or until the water is just warm. Remove the springform pan from the roasting pan and place on a wire rack – continue to cool for 3 more hours. Cover with plastic wrap and refrigerate for at least 4 hours. After the cheesecake has been chilled, wrap a hot towel around the outside of the springform pan for 1 minute, then remove the sides of the pan. To make the spiderweb: Add the chopped chocolate to a microwave-safe bowl. Heat in 30-second bursts on 50% power, stirring in between each, until the chocolate is melted and smooth. Let the chocolate cool slightly then transfer it to a piping bag and snip off a tiny corner. Starting in the center, pipe lines out to the other edge of the cake. You can do as many or as few as you like. Then, starting near the outer edge of the cake, pipe slightly curved lines connecting the spokes going out from the center. As you move in closer to the center of the cake, the curved lines should get slightly closer together. Allow the chocolate to set (it’ll only take a few minutes assuming the cheesecake was chilled). Cover the cheesecake with plastic wrap and store in the refrigerator. 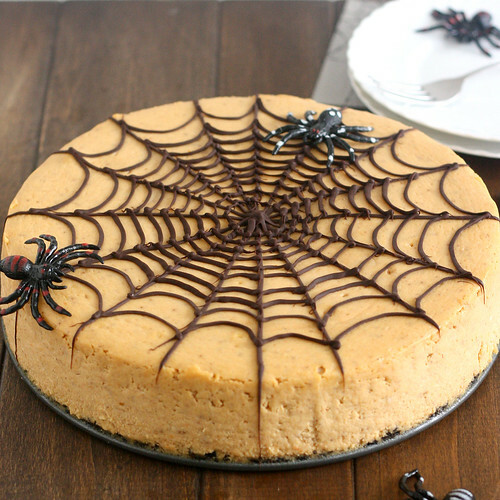 19 Responses to "Spiced Pumpkin Spiderweb Cheesecake"
Seriously you have the STEADIEST hands…Omg my web would be a MESS with all that black frosting. Wow. So impressed! And glad you made the investment with a real, rather than no-bake, one too. It sounds delish! This looks amazing. Love the spider touch! Now I’ll have something to look forward to when we have to leave Maui at the end of the week. Thanks Tracey! Everything you make always looks so perfect. This has to be the prettiest spiderweb I’ve ever seen. Hope you are safe during the storm! Looks delicious and gorgeous! Love the Halloween styling! Gorgeous! You always amaze me. There is some true artistic ability shining through here Tracey. This looks perfect. So fun, too! Halloween is an afterthought for me and Jason too. 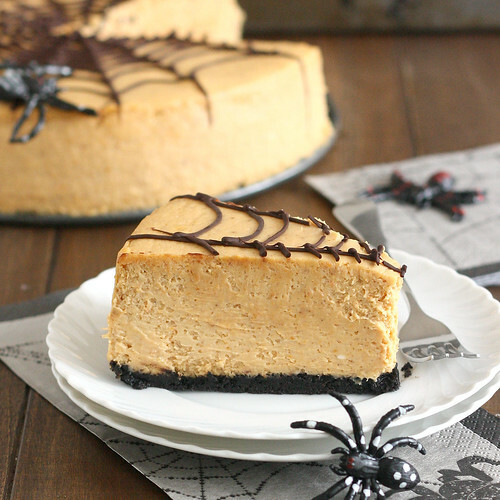 But I don’t mind the halloween treats, like this cheesecake! It’s so gorgeous! And so perfectly constructed! Well done! What a great pumpkin version – and the spiderweb just looks perfect. Love the toy spiders with it, very cute! WOW- can’t wait to try this- my kids will freak- and I mean that in a good way! Thanks! Every time I do a real cheesecake, I never regret it, even though it’s more complicated and you have to let it cool forever…..This one looks great! I am seriously jealous of your mad decorating skills right now. This looks perfect. I’ve always wanted to make one of these! 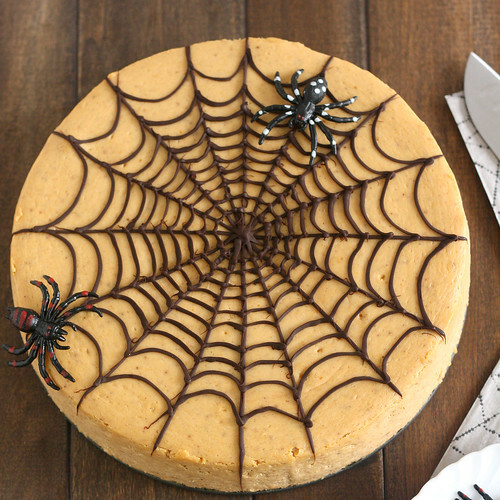 The web is gorgeous, and I like how tall the cheesecake is too. The spiders are a fun touch. That is an absolute masterpiece!! This is so wonderful! you must have some seriously steady hands, my friend. I’m impressed!